American Simon Wells, on holiday in Weymouth, is set upon and beaten up by a motorbike gang led by the psychotic King. Later, Wells puts out to sea, taking with him King’s sister, Joan. Pursued by King and the gang, they take refuge in an isolated cove, where they stumble upon a top secret establishment in which radioactive children are being raised to safeguard the future of the human race after a nuclear holocaust. 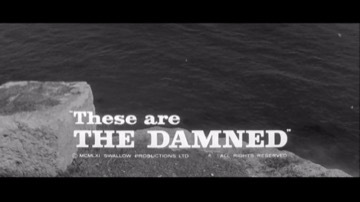 This highly off-beat production proved something of a headache and it was two years before it came down off the shelf and was released in an unsuccessful double bill with Hammer’s “Maniac” (1963).There is no credit for Production Designer on the film, but sources name Bernard Robinson as the most likely candidate for the job.